84 n Performance & Hotrod Business n April 2015 4 n PRECISION ENGINE n April 2015 PRECISION ENGINE tle body to a high-pressure Aeromotive electric fuel pump (capable of feeding up to 1,000 hp) and an adjustable bypass-type Aeromotive fuel pressure regulator from the throttle body to fuel tank, set at 45 psi. The Terminator system is designed to provide a "self-learning, adaptive" approach, with the Holley controller con- tinually adjusting the system's fuel delivery based on driver habits. While we didn't have the time to wait for the system to self- learn, (remember, dyno time is expensive and Scott had several race engines waiting for their turns on the dyno cell), Scott used the Holley handheld programming pad to essentially bypass the program and, in his words, "give us all of the fuel that the sys- tem would allow." Suddenly, the engine woke up and screamed, delivering a whopping 657 hp and 642 foot-pounds of torque in a heartbeat. While the instruction manual initially seems a bit daunting, setting up and pro- gramming the system turned out to be quite easy. Scott was so impressed by the Terminator that he plans to obtain one for his own long-term experimentation. For a renowned builder and race engine tuner like Scott Koffel to be impressed and excited about any new product is really saying something. WITH THE HOLLEY TERMINATOR EFI: At 34 degrees timing, the engine pulled a whopping 657 hp at 5,800 rpm, and 642 foot-pounds of torque at 4,800 rpm. The Terminator allowed the engine to produce an additional 13 hp over the carbureted run, which is pretty darned impressive, considering that we only spent While Scott Koffel monitors initial break-in runs, all systems were go, with healthy oil pressure and stable water temp. We never experienced a single glitch during any of the runs. 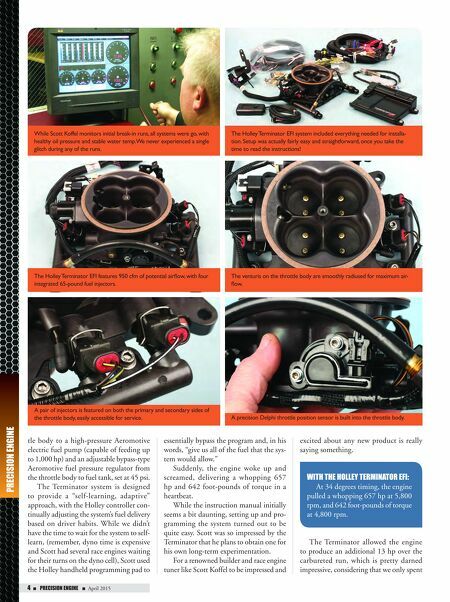 The Holley Terminator EFI system included everything needed for installa- tion. Setup was actually fairly easy and straightforward, once you take the time to read the instructions! The Holley Terminator EFI features 950 cfm of potential airflow, with four integrated 65-pound fuel injectors. The venturis on the throttle body are smoothly radiused for maximum air- flow. 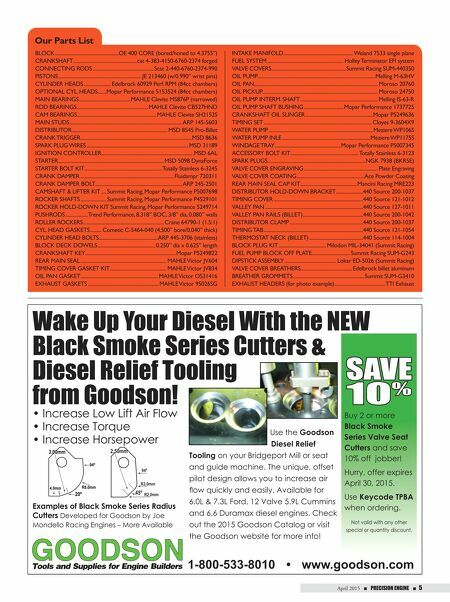 A pair of injectors is featured on both the primary and secondary sides of the throttle body, easily accessible for service. A precision Delphi throttle position sensor is built into the throttle body.